Incredibly Impressive Rooftops – What It Is? This fantastical place looks like a sky garden, boat and plane all rolled into one. 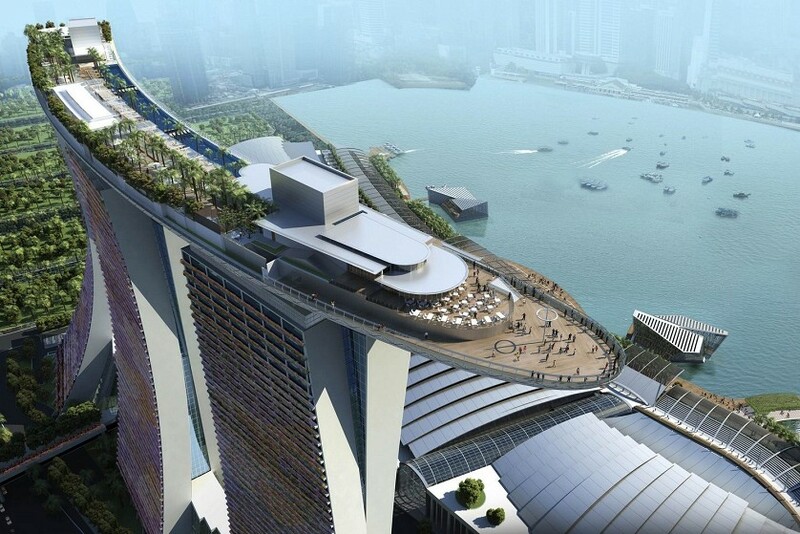 Located in the Marina Bay Sands development, this rooftop boasts around 250 trees at 190 metres high and can hold almost 4,000 visitors at one time. There are three restaurants, a swanky bar and hotel complete with a 146m long infinity pool. The views over the city are simply awesome. Getting peckish whilst shopping? Not a problem for shoppers at this complex that boasts a rooftop restaurant on the 25th floor. It might sound high, but the diners are still dwarfed by surrounding skyscrapers. The unique appeal is to have such a close-up view of some breath-taking architecture. The terrace for taking cocktails looks out over Victoria Harbour and Kowloon, so be prepared for dazzling views. This was already a seriously impressive building before they installed a first-class bar and restaurant on the roof. The Sky Bar terrace is bedecked in Thai silk and gold leaf for a luxurious finish and offers incredible al fresco dining from the 63rd floor of the State Tower in the capital. 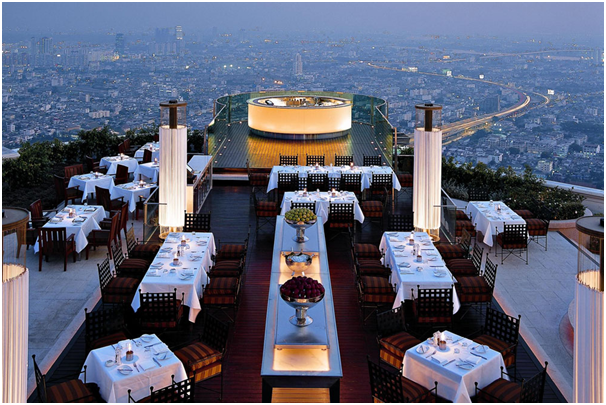 This is the highest outdoor dining experience in the world complete with 360-degree views of the city. London is one of the busiest cities on the planet, so you’d be surprised to find a rooftop garden as peaceful as this one. At this property, the tranquil roof space features a veggie plot, a honey-making bee colony and cascading waterfalls. The inner-city oasis covers 2,000 square metres, making it London’s biggest rooftop garden. It contains herbaceous perennials, evergreens and iroko timber planks with a definite Japanese feel as the building’s tenants are the Japanese bank Nomura. Ever heard the expression ‘bucolic urbanism’? Well, that’s how the architects who designed this rooftop space like to describe what it offers. It sits atop a glass restaurant at the Lincoln Centre for Performing Arts in New York and is sloped away from the busy Broadway close by. It is a serene garden space for city dwellers in a sea of concrete. It offers views of Henry Moore’s ‘Reclining Figure’ sculpture and is a place to sit and reflect.